LAST NIGHT’S SHOCK result in the Dublin Bay North selection convention highlights the difficulties Fine Gael is encountering by imposing directives on ordinary party members. Fine Gael members in the newly-created Dáil constituency revolted against the hierarchy and selected councillor Naoise Ó Muirí and former local election candidate Stephanie Regan to run in the next general election. The party’s executive council will now have to add Jobs Minister Richard Bruton to the ticket in an embarrassment for the minister and strategists who had hoped to run only two candidates in the five-seater. All political parties are extremely mindful of the need to ensure that 30 per cent of all their candidates at the next election are female. Any party that fails to reach this target will have its State funding cut by 50 per cent. For Fine Gael – which has just 11 women in its 68-strong Dáil presence – this means it will need to run about 30 women across the country. The nervousness of HQ is leading to directives being imposed that, in some cases, aren’t required. Telling members what to do will, unsurprisingly, not go down well with members, who like to think they have a genuine say in how their party is run and who runs for their party. “There was some anger against the new gender quota directives. I want the best candidate on the ticket for Fine Gael,” local councillor Keith Redmond told TheJournal.ie last night. At the convention in Clontarf Castle members were directed to select one man and one woman. The assumption was that Stephanie Regan, a local activist who is highly-rated and geographically well-positioned to hoover up Fine Gael votes, would be selected alongside Bruton. The problem was that Ó Muirí, who has been a councillor in Clontarf for over ten years, decided to capitalise on the considerable anger at the directive to force his way, very democratically, onto the ticket. He knew it was the only chance he had of running for the party as he would not be added, unlike Bruton. The irony is that even if there wasn’t a directive it appears Bruton would still not have got selected. While the results of these conventions are kept secret, Regan has made it known that she believes she finished second to Ó Muirí. This is not because Bruton is suddenly very unpopular in his own backyard, where he has been a TD since 1982, but rather the two winning candidates spent a considerable amount of time canvassing support in recent weeks as the minister was on a trade mission in India. Many ordinary members also felt that, tactically, a three-candidate strategy would work better. The only way of ensuring this was if Ó Muirí was voted on and Bruton added later. Redmond said last night there was a “large proportion of people in the room who were voting tactically” due to it being Ó Muirí’s only chance of being on the ticket. Ó Muirí is also said to delivered an impassioned speech to members. One source said that his plea was so convincing that they would have voted for the former lord mayor even if he was running against their own father. There was a similar situation last month at Fine Gael’s Dublin Bay South selection convention where members were directed to select one man and one woman. Headquarters wanted incumbent TD Eoghan Murphy and councillor Kate O’Connell on the ticket. But councillor Kieran Binchy wasn’t having it and hit out at “unelected officials” in his own party who he felt would try “spike my election” and put his name forward at the convention. While the results of the first count showed Binchy finishing ahead of O’Connell by around ten votes, it’s understood that Murphy’s surplus would have have put O’Connell ahead of Binchy. So the Rathgar-based councillor would have been selected even if there hadn’t been a directive. Parties are right to be nervous about ensuring they have enough female candidates in order to avoid funding cuts. But strategists should not assume that members are oblivious to this financial threat either. Sometimes, letting these members genuinely having their say, as opposed to telling them what to do, can result in an outcome that actually suits everyone. 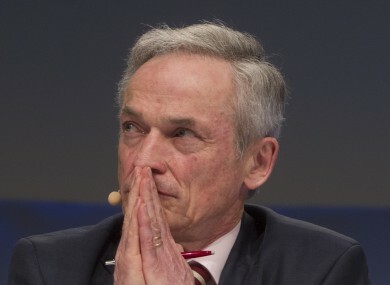 Email “Richard Bruton shocker shows why Fine Gael is going about gender quotas all wrong ”. Feedback on “Richard Bruton shocker shows why Fine Gael is going about gender quotas all wrong ”.